Cobtree Manor Park Head Greenkeeper, Martin Mewett, reports fairway management has been simplified with a Primo MAXX programme. And his turf is in better condition than ever. Read more …. Turf managers could typically cut 20 hours off the time spent mowing every week during the summer, and save up to £4000 a year with a Primo MAXX programme to reduce grass growth. Read more …. Alan Ferguson is more confident than ever that the over seeding to rejuvenate the Ipswich pitch and training ground will be more successful, thanks to a new technique proven by STRI. Read more …..
Rotation of fungicides is the key to better disease control, with proactive fungicide timing to achieve the best results time after time, according to Simon Barnaby. Read more …. Find out details about how you can get hold of the new Guide to Turfgrass Disease Control and an invaluable wall poster. Read more …. Summer applications of Heritage to target Fairy Ring and Take All infections should be made at a higher water volume to hit soil-borne and basal diseases, advises application specialist, Tom Robinson. Read more …..
Stay cool and green whilst all around are burning up this summer. Learn how Primo MAXX can help to offset the worst effects of heat stress and beat the burn. Read more …..
GREENCAST is the most advanced management tool for turf managers. 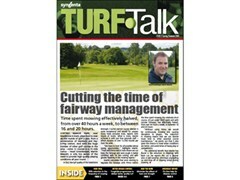 Barney Cameron reports how he puts it to effective use on Cranham Golf Course in Kent. Read more …. New Proliance Quattro contains the revolutionary System 4 Technology for faster and more reliable total weed control. Read more …. CLICK HERE to download the whole magazine.